MSRP: $31.16 to $33.95 three places in the USA and many places overseas for the 2016 re-release kit no. 04995. ​My kit's copyright date is 1974 and I paid $6.00 for it back then. The Messerschmitt Me 262, nicknamed Schwalbe (German: "Swallow") in fighter versions, or Sturmvogel (German: "Storm Bird") in fighter-bomber versions, was the world's first operational jet-powered fighter aircraft. Design work started before World War II began, but problems with engines, metallurgy and top-level interference kept the aircraft from operational status with the Luftwaffe until mid-1944. The Me 262 was faster and more heavily armed than any Allied fighter, including the British jet-powered Gloster Meteor. One of the most advanced aviation designs in operational use during World War II, the Me 262's roles included light bomber, reconnaissance and experimental night fighter versions. Me 262 pilots claimed a total of 542 Allied aircraft shot down, although higher claims are sometimes made. The Allies countered its effectiveness in the air by attacking the aircraft on the ground and during takeoff and landing. Engine reliability problems, from the pioneering nature of its Junkers Jumo 004 axial-flow turbojet engines—the first ever placed in mass production—and attacks by Allied forces on fuel supplies during the deteriorating late-war situation also reduced the effectiveness of the aircraft as a fighting force. In the end, the Me 262 had a negligible impact on the course of the war as a result of its late introduction and the consequently small numbers put in operational service. While German use of the aircraft ended with the close of World War II, a small number were operated by the Czechoslovak Air Force until 1951. Captured Me 262s were studied and flight tested by the major powers, and ultimately influenced the designs of a number of post-war aircraft such as the North American F-86 Sabre and Boeing B-47 Stratojet. A number of aircraft survive on static display in museums, and there are several privately built flying reproductions that use modern General Electric J85 engines. Revell is an old prolific model company that is based in Venice, CA and has further manufacturing facilities in Germany. They make all manner of model subjects in the popular scales. This kit came in a large shrink-wrapped tray and lid type box. 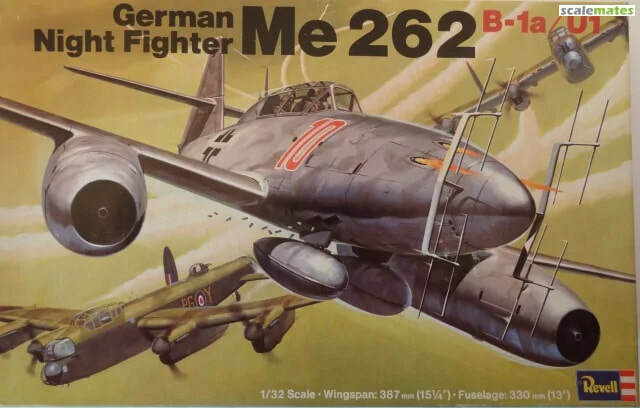 The box art shows a Me-262B-1a/U1 attacking 2 British Lancaster bombers. It is in a base of medium gray (FS26250) with squggles of green-gray on it (FS16165). It has a large red 10 outlined in white on it's sides just forward of the windscreen,. A contest talking about a contest back in 1974 is on one corner of the lid. Measurements for the completed model are shown here too: Wingspan - 387 mm (15 1/4"), Length - 330 mm (13"). 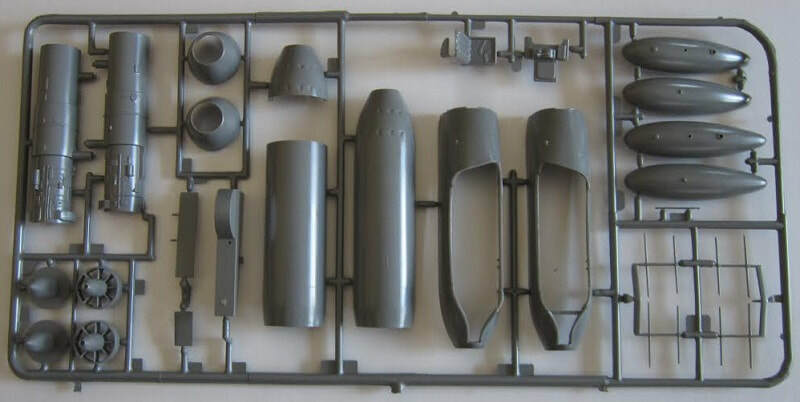 One side panel of the box has a color illustration of a Junkers Jumo 004 turbojet engine, saying that there is a detailed one in the kit with removable access panel. A illustration of 2 belly fuel tanks and their pylons is shown. This is followed by a one-paragraph history of the aircraft and kit demensions again, over the copyright date of 1974 and Revell's location being in Venice, CA and MADE IN USA. 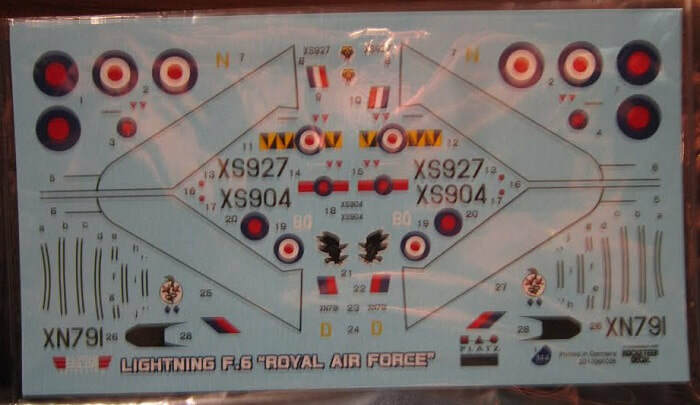 Features of the kit are said to be: 2 crew figures in flying gear, clear wing tip lights, authentic complete full color decal markings and a tail stand. 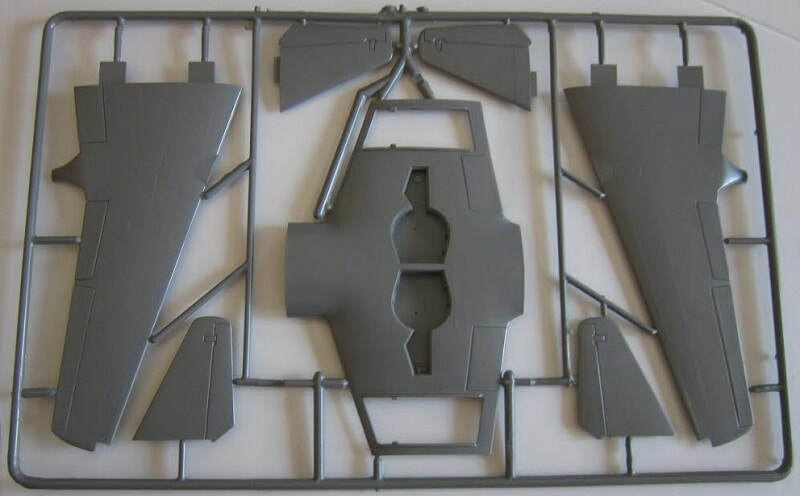 The other side panel has a small color repeat of the box art, followed by the model's dimensions once it's built again and color illustrations of the FuG 218 "Nepturne V" radio aerials and scope, precisely detailed cockpit for pilot and radar operator, hinged clear canopy, landing gear and movable wheels and a suggestion to use gray and black paints to finish the model. 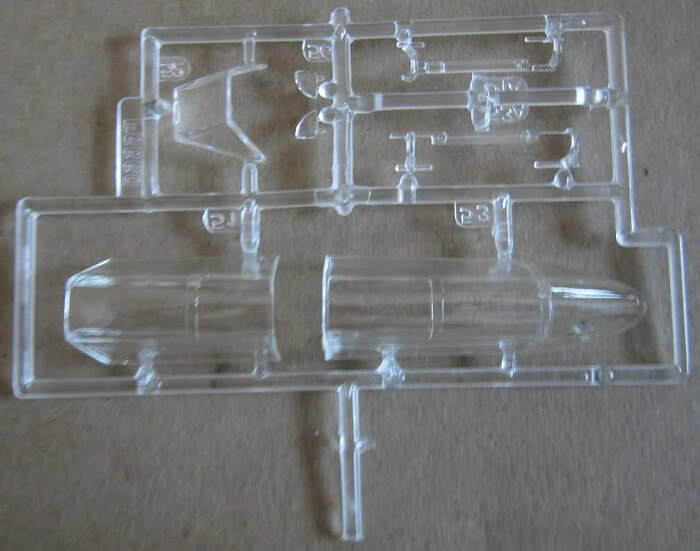 The end of the box says that the kit is for intermediate modelers, ages 10 to adult. This kit contains 4 large medium gray trees and a clear tree, decal sheet and instructions. Only the clear tree is in a sealed cello bag. The instructions consist of a single sheet that accordion-folds out into 6 pages in 8" x 11" page format. Page 1 of the instructions begins with the history of the aircraft, over a 2-view coloring instructions. Pages 3 through 6 give a balance of a total of 9 assembly steps. Part trees are not alphabetized or illustrated in the instructions. They do have part number tabs next to the parts on them however. Very nicely detailed kit. Only one marking option provided and more would have been welcome. No unit is mentioned for the one option. I purchased my kit at my local hobby shop back in the 70's.